Scientists have rediscovered the worlds largest bee. It's called the Megachile pluto, but also known as Wallace's giant bee, and lives in Indonesia. This species of bee has not been seen since 1981 but in January, scientists in search of lost species found the bee and took photos of it. The Search for Lost Species is done by the Global Wildlife Conservation Initiative. They hope to find and protect species that have not been seen in the wild in decades. In 1858, British naturalist Alfred Russel Wallace discovered Wallace's giant bee on his last day exploring the tropical Indonesian island of Bacan. The female Wallace's giant bee is about as long as an adult human's thumb and about four times larger than a European honeybee, she makes her nest in active arboreal (mud) termite mounds but beyond that not much is known about the insect. Eli Wyman, bee expert and entomologist (a scientist who specialises in insects) at Princeton University said "To actually see how beautiful and big the species is in life, to hear the sound of its giant wings thrumming as it flew past my head, was just incredible. My dream is to now use this rediscovery to elevate this bee to a symbol of conservation in this part of Indonesia, and a point of pride for the locals there." The team spent days looking at dozens of termite mounds in hot and humid conditions, and sometimes during torrential downpours. 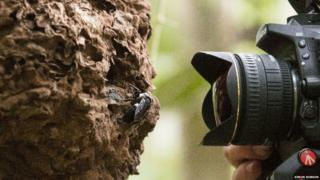 The species needs lowland forest for resin to use in it's nests as well as tree-dwelling termite nest to actually live in. According to scientists in Indonesia, forest destruction for farming, threatens the homes for this species and many others. Between 2001 and 2017, Indonesia lost 15 percent of its tree cover, according to Global Forest Watch. 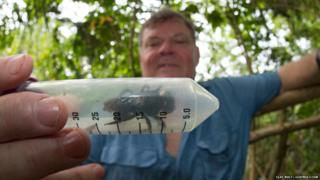 It's hoped that this discover may lead to scientists learning more about the giant bee. What is a bee brick? How can it help? The return of the 'extinct' bee?